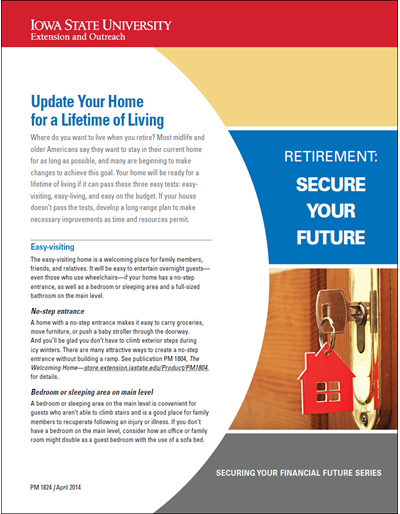 Find out if your home is ready for your retirement: easy-visiting, easy-living, and easy on the budget. Bug bugs are embarrassing and annoying. This fact sheet answers common questions related to preventing, detecting and controlling bed bugs in the home. Tips for improving the drainage around your home. 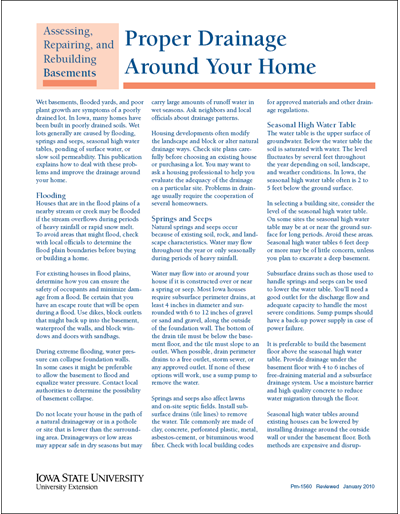 Basements can be dry if they are well-designed, with adequate drainage. 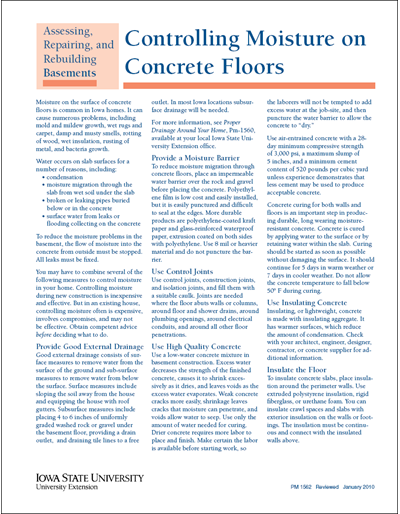 This publication discusses basement drainage, floor and wall design, concrete mixes and curing, insulation, and commercial basement products. 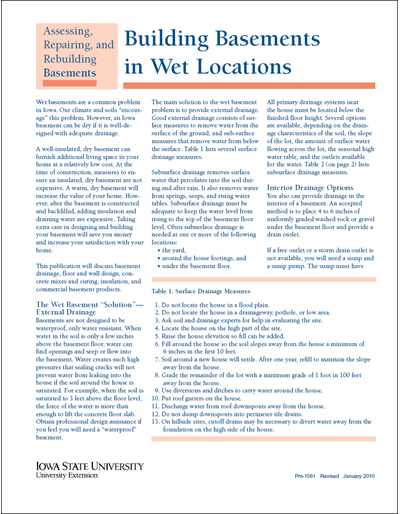 Several suggestions for dealing with basement moisture problems, keeping in mind most solutions are often expensive and involve compromises. 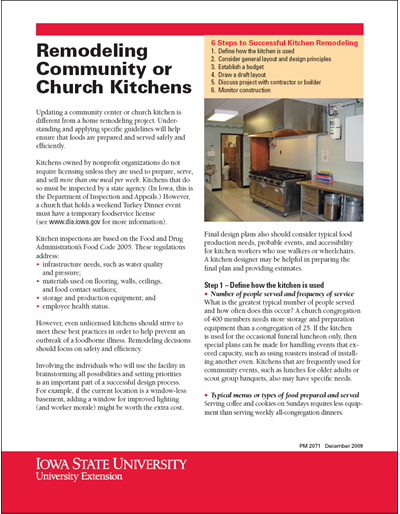 Explains the six steps to follow for a successful remodeling of a community or church kitchen. Includes photos, sample floor plans, and resources. 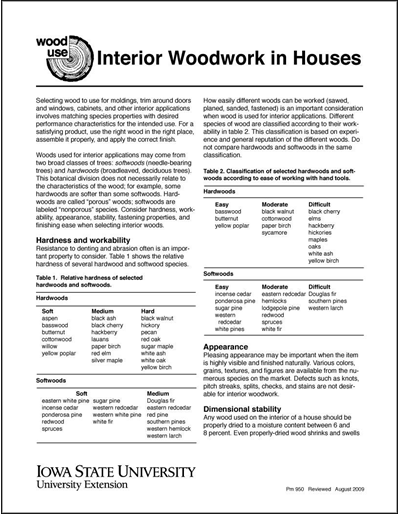 Find out about proper care in selecting and installing wood materials in houses. This can reduce decay hazards, minimize maintenance, and promote long useful service. Learn about wood’s hardness and workability, dimension stability, fastening properties, and finishing ease. 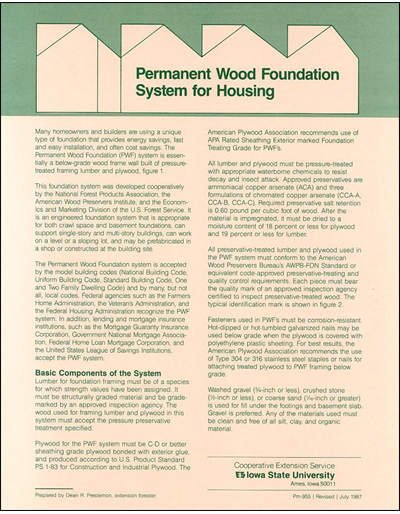 The Permanent Wood Foundation (PWF) system provides energy savings, fast and easy installation, and cost savings. Learn about its basic components, design, construction, and advantages. If you suspect your house is infested with termites or if other property in your neighborhood has termites, consult this publication for information on how to make a decision for a termite service contract. Termite prevention is also discussed. An online course to help first-time homebuyers learn about the process of buying a home. The course is available anytime, anywhere from any computer with Internet access. At the end of five lessons, there’s a certification exam. When you pass the exam you receive a homebuyer’s certificate which you may take to a local lender. Computers at public libraries, ISU Extension county offices across the state or USDA offices are options if you don't own a computer. • shop for a mortgage that works for you. Financial Recovery and Risk Management. 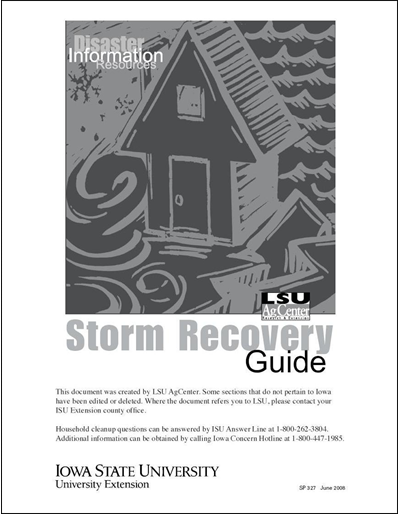 This 32-page resource was created and made available in PDF by LSU AgCenter. 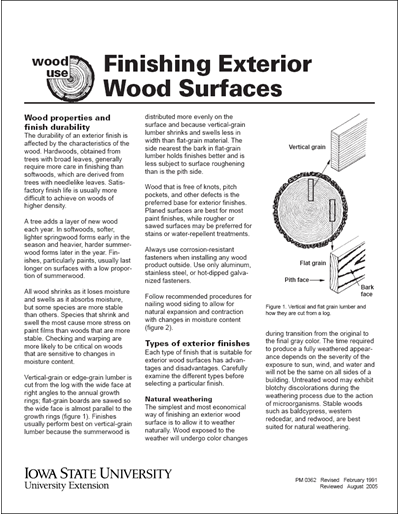 Learn how to finish, preserve and even refinish exterior wood surfaces. Includes natural weathering, clear film and water-repellent finishes, as well as bleaching oil and pigmented stains. 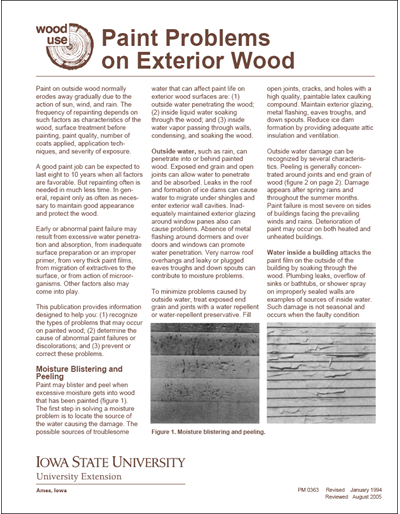 Learn about how to identify, prevent and alleviate problems with painted exterior wood. Includes pictures and detailed descriptions. Siding can do more for the exterior surface of your house than any other home improvement. 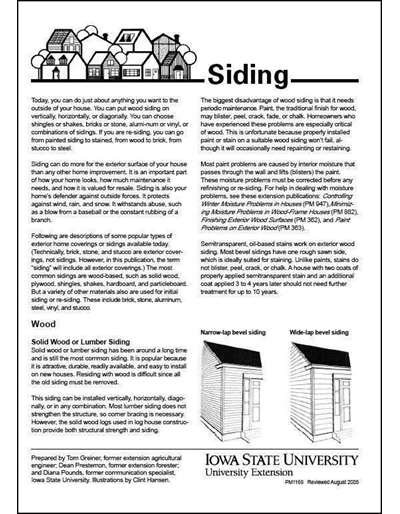 This publication discusses all aspects of different forms of wood, metal, synthetic, and masonry siding. When wood cannot be kept dry and protected from deterioration, preservative treatment can ensure long-term durability. 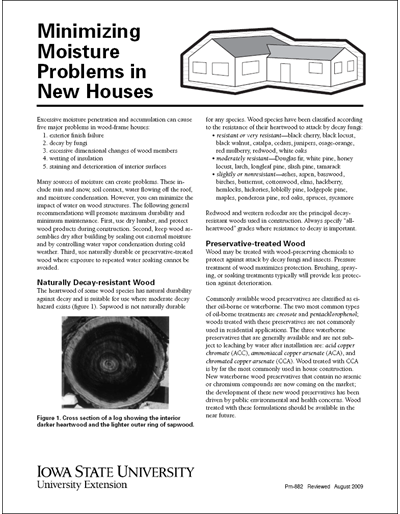 This publication covers the types of wood preservatives, treating methods, how to select treated wood products, and handling and disposal precautions. 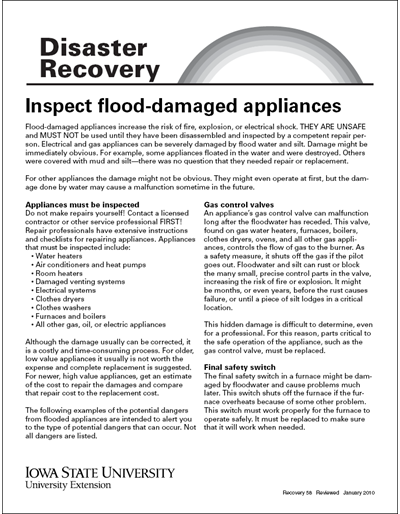 Flood-damaged appliances are unsafe and must not be used until they have been inspected by a professional. Some damage might not appear for months. A whole-house fan can help keep your house cool during much of spring, summer, and fall without using an air conditioner. Fans have advantages such as saving energy and money but also some disadvantages. 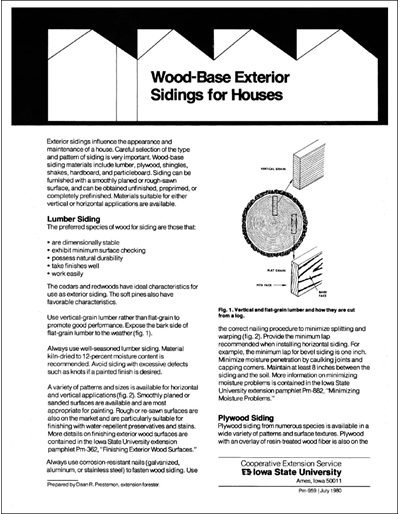 Learn how to select the right type and pattern for your wood-base siding to promote long service life and minimize maintenance.